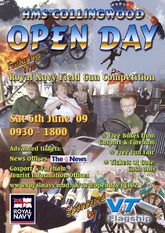 Welcome to the HMS Collingwood Open Day website, giving you information about the variety of events taking place on Saturday 6 June 2009. The main event will of course be the 2009 Royal Navy Field Gun Competition. Other attractions will be FREE FUN FAIR, including a variety of children’s entertainment, “Endeavour” Zone where you will be able to visit the hi-tech Bridge Training Simulator used by the Royal Navy to train Navigators, and second arena which will include dog displays, “Tigers” Motorcycle Display Team, commercial and charity area and much, much more. There will be plenty of free parking, in fact leave the car at home and come by bus – we will be providing FREE buses from Gosport bus station and Fareham train station stopping at various locations en route. Details of timetable and stops to be issued in due course. With disabled facilities, catering outlets and FREE FUN FAIR this really will be a day to remember!